The NLMD was formed in 1990 as a tool to assist the farming industry to achieve greater value for livestock and to increase the profitability of farm stock. The concept was simple; to take existing information from the farmer and portray it in such a way as to highlight areas where the farmer was doing well, and achieving a good return, and to highlight areas where this was not the case. Having gained the support of the farming community during it's pilot in 2005/6 with the South West Livestock Pilot, the NLMD is being regularly updated with new features and reporting tools. To use the NLMD, you must be a registered user. Registration is simple and free of charge. 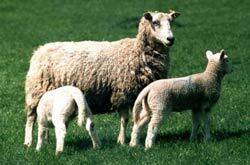 As a registered user, you can upload your data to the NLMD directly from the FarmWorks by Shearwell Data program. By registering you are able to view data reports generated from the FarmWorks backup file. For more information about the reports that are available, click here. National Livestock Management Database Livestock Tracing (NLMD-LT) is an industry owned and run company that provides information and tools to the industry for the collection of Statutory Livestock Movements and Holding Register information. NLMD-LT works with industry partners to automate and streamline processes, making it the most accurate and efficient way to collect information and aid farmers in the collection of EID and batch numbering of livestock. Click here to find out more. StockMove Express - Stock registrations via the mobile phone! Shearwell Data Ltd have joined forces with the NLMD to enable real-time birth and movement registrations to be sent to BCMS via it's CTS facility using a simple handheld mobile phone. The application, StockMove Express, allows the farmer to record data in the field using the telephone keypad or an optional EID stick reader. Once entered, the mobile phone links to the NLMD to record the birth or movement request and the NLMD sends the request on to CTS for authorisation. The NLMD is key to the application's success, polling CTS regularly for updates and making sure the producer is kept informed throughout the process. StockMove Express is the next step in reducing paperwork and the administration for the producer. For more information, visit the Shearwell Data Ltd web site. Defra's South West Livestock Pilot final report concludes that the NLMD provided benefits to flock management and added value over and above data supplied to farmers by other methods.